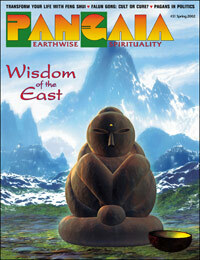 PanGaia #31 Wisdom of the East (download) [pg031e] - $5.95 : BBI Media - Magazines that feed your soul. In this special issue, PanGaia looks to the spiritual paths of Asia to find inspiration and wisdom to apply to our Pagan ways. The ancient Chinese developed Feng Shui based on the their unique spiritual view of the world. By recognizing the force of chi in the landscape, they discovered universal principles for aligning ourselves with the underlying forces of the universe. Find out how you can use this ancient art in your life in "Path of the Dragon: the Art and Science of Feng Shui." Wonder what all the fuss is about the new Chinese religion Falun Gong? Find out in our exclusive article "Eastern Mind, Western Life." April Thompson was intrigued by the description of a Vipassana retreat: ten days of complete silence. Find out what she discovered about her path in her essay "Facing North." Chiran is a small town in southern Japan, where an enclave of Samurai warrior homes served as a defensive perimeter centuries ago. When Lenny Karpman travels there, he doesn't find a martial spirit, but one of contemplation. Follow his journey in "A Stroll Down Samurai Lane." Tucked away in the back street of Bankok is Ban Baht "Monk’s Bowl Village" where the black bowls used by monks to collect food are made in the traditional manner. In "Old Faithful: the Monk’s Bowl" our correspondent Rob Dunlop describes the practice of alms-giving in a Buddhist context. Plus: the Science and Magic of Spirit (fifth in our series on Elemental magick); a profile of the Missouri Pagan community Ozark Avalon; a brand new folk tale by Barbara Fisher, "Coyote Steals Kokepelli's Flute," the PanGaia Pagan crossword; a riled-up Toe to Toe debate, "Should Pagans become involved in politics? "; R. J. Stewart on Titans and Giants; a family-friendly Beltane ritual; reviews, poetry and much more. 80 pages, published in the spring of 2002.